DJ and live music, dancing, cash bar. This is your chance to hobnob with the candidates!! Meet them all; chat about our Town! Then VOTE for who you want to see ride in the parade on June 9 as Milton's "Mayor." Vote early and often! Questions? Contact Brian Kelley via email here or phone him at: 617-615-9249. See you there! Funds will continue to be accepted for the Mayor of Milton until 7:00 PM on May 7. The purpose of the contest is to have fun while collecting dollars to help pay for Big Event Weekend activities (field day, concert activities, parade, etc.) as well as other fundraising initiatives of the 350th Committee, including the Legacy Gift to the Town. The Mayor of Milton will be officially recognized while riding in the 350th Anniversary Parade in June 2012. The position carries no official power. Each dollar collected equals one vote. The candidate with the most votes (dollars) wins the “election". You can vote on-line here, or send a check, made out to “Town of Milton” with “Milton 350th” in the memo. 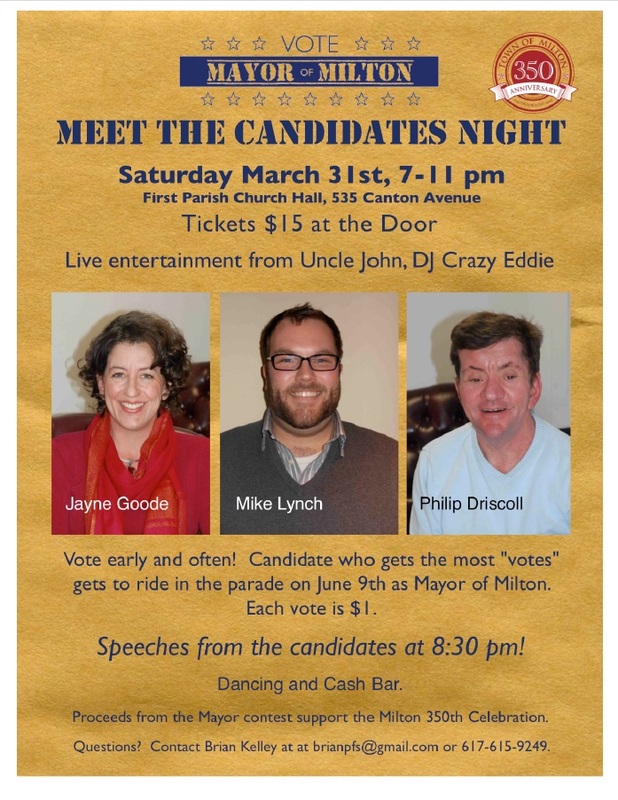 100% of net proceeds, after expenses, raised by a candidate will be donated to the Milton 350th Committee. All funds are due to Brian Kelley, Chair, Mayor of Milton Campaign, by 7:00 PM on May 7. For questions, please email Brian here. Click on the flyer above.